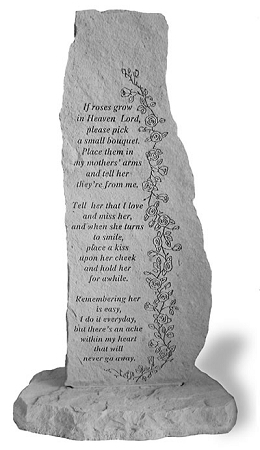 Home > Specialty > Religious Theme > Memorial Stone, Upright - If Roses Grow In Heaven Lord.. This obelisk memorial makes a touching tribute to the mother we have lost. Note the beautiful flowers adorning the memorial stone pillar. The memorial is made of cast stone that has a rich texture with the look, feel and weight of true stone. It is weatherproof and has year-round durability. Made in the USA. If roses grown in Heaven Lord, please pick a small bouquet. Place them in my mother's arms and tell her they're from me. but there's an ache within my heart that will never go away. Angel Statue Gone Yet Not Forgotten..
Garden Stone, Upright - Lord You Said..